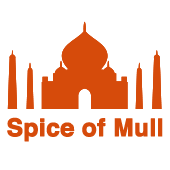 Chefs here in Spice of Mull always strive to deliver authentic dishes from Bangladeshi, Indian, Thai and Chinese cuisines. With years of experience and commitment to customer service, we hope to impress and satisfy all our customers be they locals our tourists visiting our wonderful Isle of Mull. Address: 25 Main Street, Tobermory PA75 6NU, Scotland, UK. © 2018 Spice of Mull. Designed by CineEye.